Japanese fixed gear shop JAN teamed up with Japanese porter company Crank to make some co-branded bags. 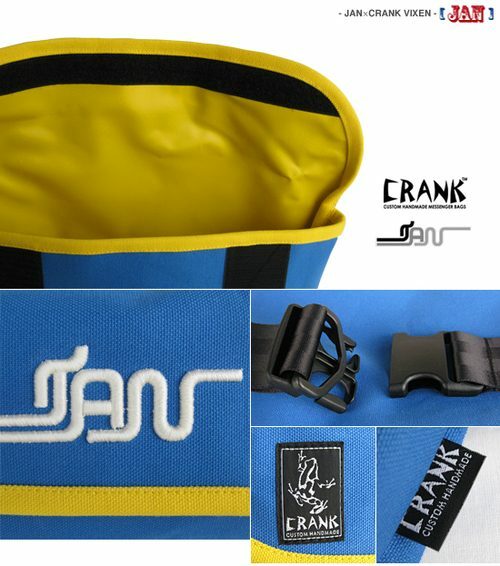 JAN chose Crank’s popular Vixen model to embroider their logo onto the flap. The Vixen model is a growing trend in the “less is more” world of fixed gear riders. Big bulky bags are out and smaller, hip-sized bags are in; the carry only what you need mentality. I’d use it as a hip bag for sure. Many more detailed photos over at the JAN shop.